Swansea City striker Andre Ayew has been named August's Barclays Premier League Player of the Month, while Manchester City boss Manuel Pellegrini has won the managers' award. Ghana international Ayew, 25, has scored three goals as the unbeaten Swans sit in fourth place with eight points from their opening four games. Pellegrini's side lead the table with four wins from four games. They have scored 10 goals and are yet to concede. Ayew took the award ahead of his team-mate Bafetimbi Gomis as well as Manchester City duo David Silva and Aleksandar Kolarov. Also nominated were Leicester's Riyad Mahrez and Manchester United's Chris Smalling. 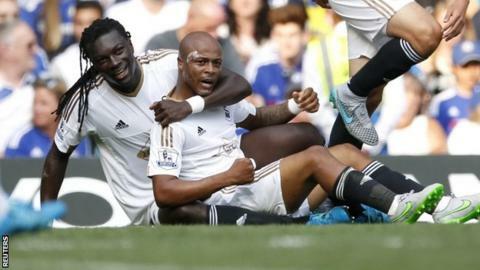 Ayew joined Swansea in June from French club Marseille and scored on his Premier League debut against Chelsea. He and Gomis have provided all of Swansea's seven league goals so far. They visit Watford on Saturday. Pellegrini's side visit second-placed Crystal Palace on Saturday and the Chilean said he wanted his team to carry on with their stylish play. "The highlight was the way we played," he said. "It's important to continue the style of football, the team won the four games in the way I like to play." Palace boss Alan Pardew was also nominated for the managers' prize, along with Swansea's Garry Monk and Leicester City manager Claudio Ranieri.